The new EP12WS and the ES10-N01 are the perfect synthesis between German productivity, made possible thanks to technology and design, and the competitive prices of Far East’s products, which lead to a considerable cost effectiveness. 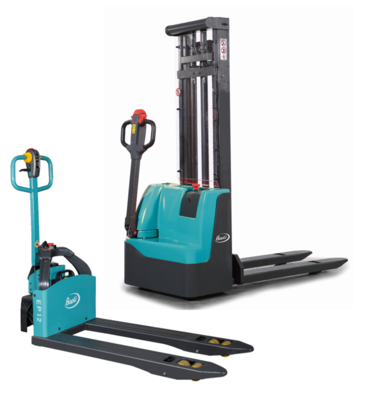 BAOLI’s brand new EP 12WS arrives on the market, it’s an electric pallet truck with capacity of 1.2t combining awesome efficiency and low management costs. EP 12WS differentiates for its light but strong structure, ensuring reliability and ease of use, and makes it perfect for operating in each situation: from discharging trucks, to use in small warehouses and in shops. EP 12WS is provided with a DC drive motor with 650W of power that, thanks to high efficiency and speed, gives the customer excellent performances and allows him to overcome ramps up to 4% when laden, and up to 10% when unladen. It is environment-friendly thanks to its Li-ion batteries of 20 or 26 Ah maintenance free, that can be taken off the truck with a simple gesture thanks to the innovative design. A single charge can grant up to 3 hours of continuous working, and short charging time (a full charge lasts only 2.5 hours) combined to the absence of memory effect give you an always ready to work truck. To ensure the maximum maneuverability of the truck in each working condition, EP 12WS is provided with a simple and ergonomic tiller with controls, battery level indicator and starting key all easily reachable. The best attention was given to all safety related aspects: each detail was designed with care, like electric parking brake that automatically ensures the truck and its load when the operator is not using it. The Baoli’s bestseller ES 10-N01 represents the perfect choice for non-intensive work situations: it is compact and functional, can handle loads of up to 1000 kg, has a comfortable 4-support-point layout and an ergonomic side tiller for excellent stability and driveability. In order to guarantee maximum flexibility of use the ES10 is also fitted with 2×12/85Ah automotive batteries with built-in battery chargers and It features a battery charge indicator with lifting cut-off function. The truck is available with lifting columns up to 3,5m which guarantee maximum visibility and a high level of reliability over time. Versatile and easy to use, the EP12WS together with the ES10-N01 perfectly represent the Baoli smart idea of non intensive movimentation of goods.